Vivid and colorful playing cards—perfect for the modern day cardist. Tessellatus features a mosaic-themed back design, paired with a vivid and vibrant color palette. The faces feature a similar mosaic theme, with fully custom pips and court cards. Printed by the USPCC. Linoid Finish. Crushed Stock. No Reprints. Borderless Back Design. Fully Custom, Geometric Art Style. The Design The main focus behind this design is to accentuate every flourish, such as fans, spins, and etc. This design allows you to reach full potential when flourishing, achieving new heights while flourishing with the vivid colors. The Back The back design is borderless style. Making it borderless allows the design to visually enlarge, while also making each card merge seamlessly together, establishing new forms. The borderless back design is combined with vivid colors that harmoniously blend together when in motion to create excitement when flourishing. 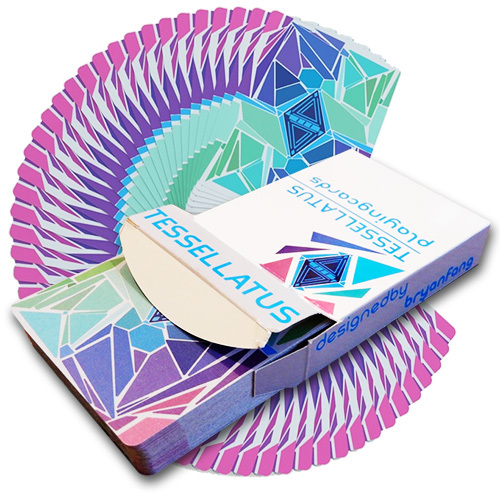 The Tessellatus playing cards are also a Two-Way fanning deck, meaning that there's multiple ways to display a fan with these cards. The Front The theme of the cards to the front is as well- colorful and mosaic. Everything is custom: from the pips to the font and the court cards. Are included these side designs to highlight your fans and spreads. So that you guys don't get too homesick, have been maintained the key features of the standard USPCC court cards, like the King of Hearts (Suicide king), the Queen's flowers and etc. The Box The box is clean, sleek, and straight to the point. It features a white front and back, and grey edges. There is also a simplistic blue line across the box, which give you a hint to what kind of features you'll see within the deck. Handling Other than the design, the handling is also a very important feature. Tessellatus Playing Cards are printed by USPCC on the Crushed Stock. A Linoid Finish is also added to provide the smoothest experience of spreads, fans, and shuffles. • The cards are poker size. Αυτό το προϊόν προστέθηκε στον κατάλογό μας την Wednesday 27 September, 2017.